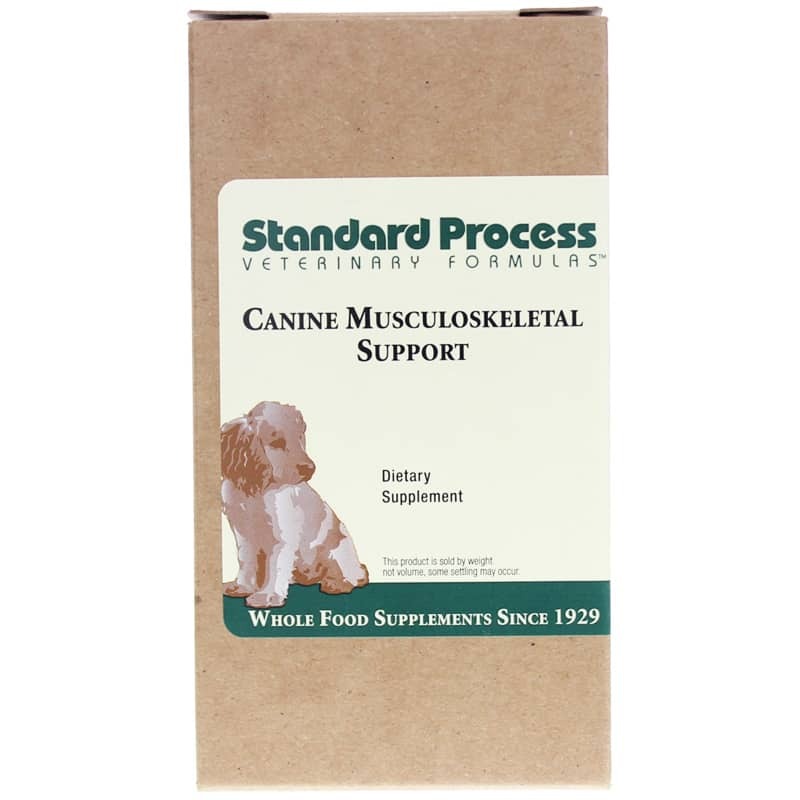 Canine Musculoskeletal Support from Standard Process is a pet supplement designed to promote health in dogs at all stages of joint and muscle dysfunction and disease. Whether your pets are healthy athletes or arthritic seniors, they can get more from life with joints that move smoothly and muscles that support those joints. Canine Musculoskeletal Support includes a rich blend of vitamins, C,B, D and E because when exercising dogs require five to ten times more water soluble vitamins. 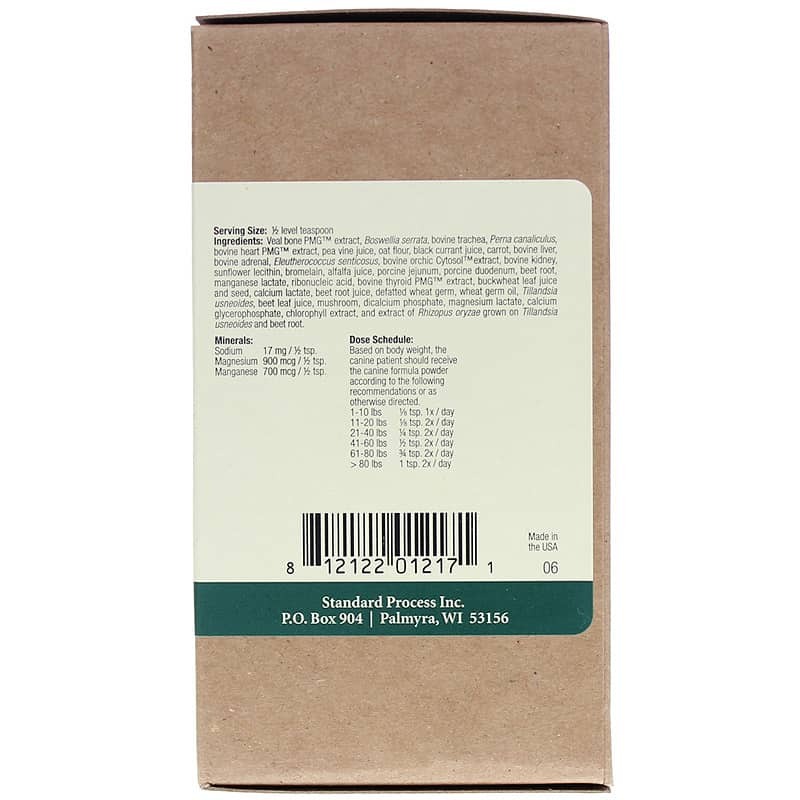 And as with all of the pet formulas, this supplement contains a balance of additional ingredients because no system functions independently. So, Canine Musculoskeletal Support helps your pet's health by including tissue extracts from kidney, liver, adrenals, intestinal jejunum, and muscle and bone protomorphogen. In addition, pea vine juice, alfalfa juice, mushrooms, and beet root and leaves supply whole vitamin complexes and chelated minerals. Other ingredients help reduce inflammation and support cartilage. Veal bone PMG extract, Boswellia serrata, bovine trachea, bovine heart PMG extract, Perna canaliculus, pea vine juice, oat flour, black currant juice, carrot, bovine liver, bovine adrenal, Eleutherococcus senticosus, bovine orchic Cytosol extract, bovine kidney, sunflower lecithin, bromelain, alfalfa juice, porcine jejunum, porcine duodenum, beet root, manganese lactate, ribonucleic acid, bovine thyroid PMG extract, buckwheat leaf juice and seed, calcium lactate, beet root juice, defatted wheat germ, wheat germ oil, Tillandsia usneoides, beet leaf juice, mushroom, dicalcium phosphate, magnesium lactate, calcium glycerophosphate, chlorophyll extract, and extract of Rhizopus oryzae grown on Tillandsia usneoides and beet root.